A planning application has been submitted for eight homes in the grounds of Linney House. The scheme is modern in design. That is a radical departure from the previously approved schemes which were uninteresting suburban designs. The scheme also tackles the issue of flooding. Part of the site lies in Flood Zone 2 and the previous application strayed into this. 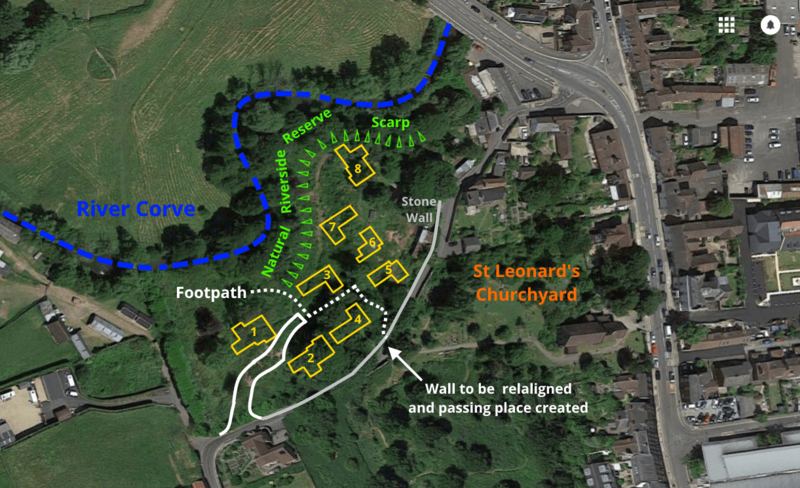 The current applicant plans to reprofile the site to restore the ground to the levels it had prior to the site being quarried lifting all the homes out of the floodplain. A wildlife corridor will be created along the Corve. This proposal will need to be scrutinised in detail. My provisional view is that this is a far more attractive and feasible scheme than the previous proposals. It is well designed and landscaped. It will add to the character of the area. But it will generate extra traffic. The Linney should be brought into the town centre 20mph zone if this scheme is to proceed. The development will have two 3-bedroom and six 4-bedroom homes (19/00826/FUL). No affordable housing or housing contribution will be provided. Under government rules Shropshire Council cannot apply an affordable housing levy for developments of ten or fewer homes in Ludlow. Over the years, the site has been quarried, used as a coal yard and as the winter quarters for a circus. The developer says that the subsequent Linney House garden was not maintained and the trees fell into a poor condition. The proposal is to reprofile the site to its pre-quarry levels. All houses will be detached. The external materials will be “of the local vernacular” including Ludlow brick, local stone and timber cladding treated to silver. The roofing will be Welsh slate with solar panels clad in slate. There will be two parking spaces for each house. Car ports will have green roofs and EV charging points. Hard surfaces are to be of natural materials and permeable. Rainwater will be attenuated through underground storage with controlled slow release and through green planting. It will take me a while to scrutinise the documents and form a definitive view. My initial opinion is that this proposal ticks all the boxes under planning rules. It meets the requirements of the 2018 National Planning Policy Framework for good design and building at a higher density. The landscaping and greening proposals are first class. The sustainable drainage proposals look to meet modern requirements. The floodplain problems seem to have been resolved by building up the land to its former levels. The difficulty with any proposal for development of this site is extra traffic on the Linney. That has been partly resolved by creating a passing place. I would like to see the Linney brought into the town centre 20mph zone. Shropshire Council surveyed traffic speeds on the Linney a couple of years ago and the road qualified for a reduction in speed limit without horrors like speed humps. With that qualification, I am minded to support this scheme. The site already has planning permission for a development that could best be described as boring, even bourgeois. I would not expect this application to be refused but it is early days. This site has a complex and at times controversial history. The first application for four homes was submitted in May 2012. A revised scheme for three homes was approved by planning officers in June 2014. 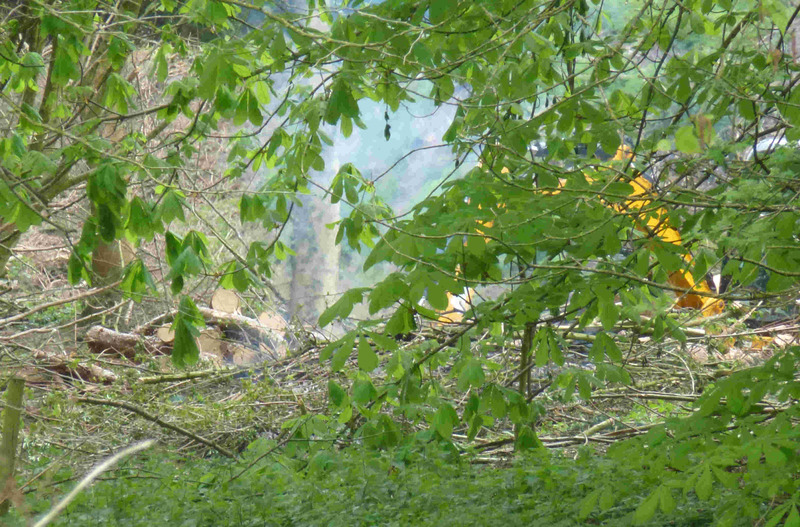 Many trees were cleared from the site in May 2015. In 2016, Shropshire Council decided not to place a tree protection order on the trees. In January 2017, a new application for three large detached homes was submitted a few months before the 2014 permission expired. The applicant never had any intention of building these houses and said: “The intention of the application to secure a consent for a further 3-years to facilitate on-going negotiations with the Council to secure an alternative scheme for this sensitive site.” Planning permission was given in May 2017. Linney House development: I welcome good quality modern design that pays tribute to 21c skills whilst respectful of the historic setting; congratulations to all involved. As a home owner in lower Corve Street, on land that lies below Linney House, I’m as excited as anyone could possibly be over the proposals for sustainable drainage; including the use of water permeable hard surfaces. On a related. matter of speed control – and this applies to lower Corve Street as well – if sleeping policeman actually work then I’m for it. Here where I am in London Docklands, we have a system of raised cobbles that traverse the full width of the road with a bollard each end on the pavement to prevent vehicles mounting it. These narrow strips of cobbles are placed at suitable short intervals – uncomfortable at speed but easy on the eye. I’ve seen something similar in Shrewsbury near The Square. Increased road traffic will definitely be a problem as invariably if I drive along that stretch, (which I try not to do very often) there’s a good chance of meeting another vehicle between the Corve St turn and the sharp bend. To pass each other one vehicle has to reverse and try and tuck into a drive opening or the corner by the graveyard. It’s very narrow, basically a country lane in the middle of town. 8 houses could mean at least 16 cars? The extra traffic would be more than compensated by the new passing place. Looks a good scheme.